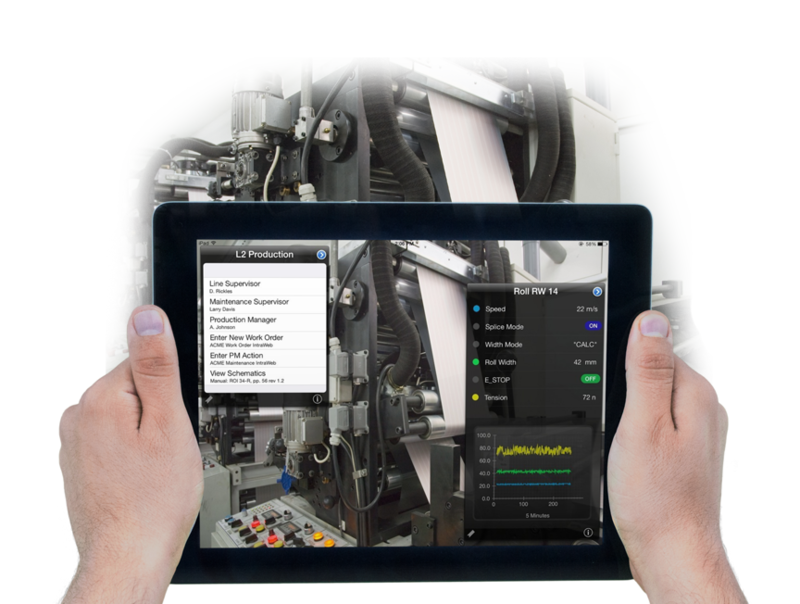 Augmented Reality displays information relevant to nearby process equipment on mobile and wearable devices. Users simply point their device camera at equipment to display related live process data (from PLC, SCADA or ODBC compliant systems) as well as active links to documents, schematics, videos, and forms. QR codes are used to identify equipment or process areas, also known as Points of Interest or POIs. AR capable Apple IOS devices and Microsoft HoloLens view the POI resources in an AR Scene that, once created, is persistent across all similar devices. The solution also contains a form creator and event notification feature. iQagent is available for use on mobile devices such as Windows tablets, iPad, iPhone and Android as well as wearables. Engineers and Technicians view live process data from PLCs, SCADA, and Production Databases, based on where they are working in the plant. Production Supervisors ‘show’ downtime and process issues to offsite resources, rather than waiting for them to arrive while production is stopped. Managers and Executives stay on top with live KPIs right on their smart phone or tablet, anywhere they have a connection to the plant network. Why is iQagent a holistic AR solution? Holistic means all encompassing; taking everything into account; to understand the whole. iQagent will enhance productivity providing an augmented reality view of your plant, displaying the camera video feed combined with live data (from PLCs, HMI or SCADA system) and technical resources relevant to the equipment or process being viewed. This allows you to view process data, schematics, or other technical documents right at the equipment you are working on. iQagent can also be used with URL based PM and trouble reporting systems to allow entry of trouble reports or preventative maintenance activities. You now have a holistic view of your process with data and resources linked to equipment the data represent. To capture process issues, iQagent records the entire display, video, audio, process data and on-screen annotations which can be sent to offsite resources as a video file for quick analysis and resolution. What OS/Platform does iQagent Server support? The iQagent Server, which provides data to the iQagent mobile clients will run on Windows 10 and server OS as well as Linux, Ubuntu and others. We also run on Raspberry Pi and IOT Gateway platforms. iQagent clients are available on IOS (iPad and iPhone), Windows 10 Tablets, Microsoft HoloLens, and RealWear HMT-1 devices. What is a POI (Point of Interest)? A Point Of Interest or, POI, is anything in your plant or process, real or abstract, that can be characterized by data. Examples of POIs are Motors, Pumps, Production Line Output, Work Cells, or warehouse Activity. POIs are used by iQagent to identify equipment or processes in the cameras field of view. They are configured using the iQagent Configuration utility and can contain OPCDA, OPCUA or ODBC process data, technical documents, videos, forms, email or phone numbers, or links to intranet data entry or reporting systems. Each POI generates a unique QR Code that can be mounted on or near the equipment or process it represents. The iQagent mobile client scans the QR Code and displays the configured data. Do I have to scan a QR code to see POIs? No. iQagent allows direct selection of any POI from a menu. You can view data and resources from one or more POIs sitting at your desk, while in a meeting, or at home, or anywhere you are connected to the Plant Network. Any POI can be added to your Favorites List for quick display anytime. For iQagent AR (Augmented Reality) versions such as Microsoft HoloLens, you can just place POIs or data points where you want then in holographic space. Will it work over a cellular connection? Yes. Just configure a VPN to your Plant network. What about security? Can someone take control of my plant using iQagent? No. iQagent can use TLS encryption to communicate between the iQagent Server and iOS client. QR Codes are encrypted and contain no useable data. Also, iQagent does not allow a write back via OPC, so it cannot be used to actually control the process. Can my equipment or process use iQagent? iQagent connects to automation systems using OPCDA, OPCUA or ODBC connections. So, if you are using standard PLCs, HMI, SCADA Systems, ERP, MES, SAP or other database centric systems, iQagent should be able to connect to it to show live data. You can also link to document servers and web or URL based systems (such as Microsoft SharePoint) for Info View items. The iQagent configuration tool sets up a Website using IIS, which is a handy document and ASP page repository for those who want to create their own interfaces. What is the process of integrating iQagent in my equipment? iQagent is fairly easy to set up. You’ll need a Microsoft Windows Server OS (preferable Windows 2012 R2 or higher) on your plant network where you will install and license the iQagent Server and Configuration utility. Once the software is installed and licensed, you will use the configuration utility to create POIs for your plant floor, assigning data points, technical documents and URL links to each. For each POI you will generate a QR Code which will be mounted on or near the equipment or process it represents. Then, install the iQagent App on desired iOS devices and register them with iQagent using the configuration utility. Now you are ready to use the system. Use iQagent to scan QR Codes on the floor and view live data and resources for each POI you have configured. Can I pay someone to integrate iQagent in my plant as a turnkey system? Sure, we have trained resources that can help. Contact us for more information. iQagent is licensed based on the number of unique iOS devices registered with the system. The minimum license is for 5 devices. Contact us for pricing information. Can iQagent be customized for my process? Yes. ASP Pages can be created which allow you to interact with or extend existing data entry systems, such as trouble reporting and preventative maintenance systems. You can also interact with our configuration database directly to programmatically generate or change POIs on the fly. The iQagent Configuration utility includes a web site which is a handy repository for ASP Pages and URL resources you want to use. Contact us for more information. Is there a demo for iQagent available? Yes. iQagent and iQagent for iPhone are free from the Apple App store. There is a fully functional demo mode so you can check out all of iQagent’s features within seconds of downloading. After you have installed and launched iQagent on your iOS device, scan these QR codes to see it in action. You can also select the POIs from the onscreen menu. or you can contact us for a free demo. iOS 11.x and earlier versions are currently supported. Contact us via the form at the bottom of the page.